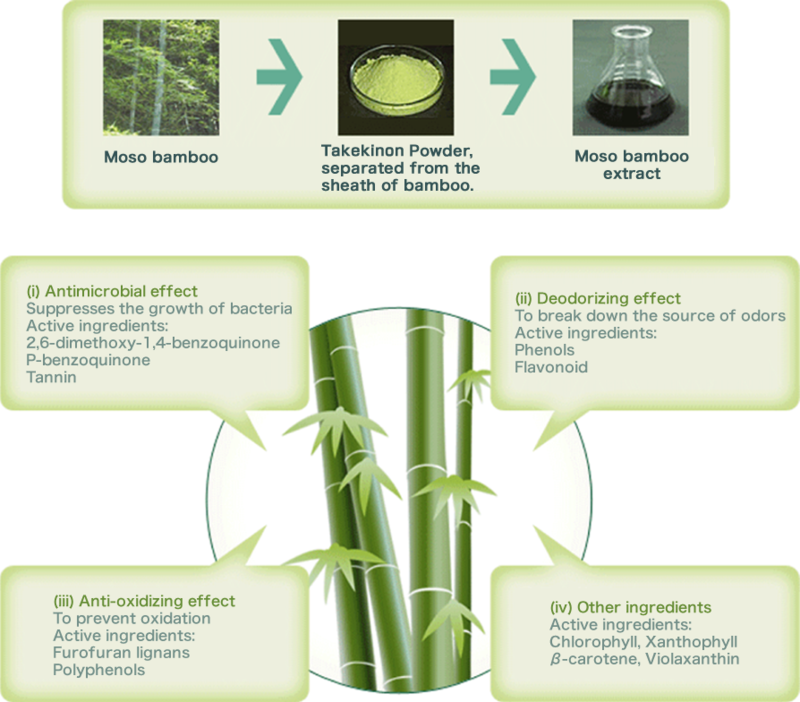 What is Moso bamboo extract? Bamboo has been closely involved with Japanese clothing, food, and housing. In particular, most of the relationship between bamboo and the Japanese diet has been in the preservation of food. Bamboo skin is used to wrap rice balls or meat. Bamboo sushi, bamboo-leaf-shaped kamaboko (steamed fish paste), and Japanese sweets are well known. In these ways, bamboo has been used traditionally to improve storage life. Takex-labo investigated which part of bamboo contains the most ingredients to enhance the preservation of food and discovered it is mostly in the green sheath. Bamboo grows 20 meters in 2 months during the growth period. This fast growth is enabled by the intense nutrition contained in the white fiber inside. This nutrition consists of components that are perishable, easily be oxidized, and cause mold immediately. The green sheath protects this fiber from bacteria, mold, fungus, rot, and insects. In addition, we have been advancing research into which ingredient of bamboo improves the storage life of food. Takex-labo hopes to deliver to people secure, safe food and living environments with bamboo extract as the main ingredient, and will continue to engage in further bamboo research and development. Takekinon Powder has 2,6-dimethoxy-1,4-benzoquinone as the major component. Takekinon Powder was obtained from the crushed sheath of the stem of a gramineous Moso bamboo grown in China and Japan using extraction by ethanol.This product contains 2,6-dimethoxy-1,4-benzoquinone, lutein, chlorophyll, and has antibacterial effects so it can be used as an agent for improving storage life. The Moso bamboo used by Takex-labo as a raw material can be only obtained in Japan and China. In addition, we carefully selected the Moso bamboo in Kyoto Prefecture. Moso bamboo is easily influenced by the impurities of pesticides, and strict quality control is required. We have checked the components of bamboo in Kyoto for one and a half years, and we now use Moso bamboo that has been certified as being without quality problems. Our efforts in quality management are evidenced by zero quality accidents since our establishment. The active antibacterial ingredient is 2,6-dimethoxy-1,4-benzoquinone (Figure 1), which has a very strong antibacterial effect that has been reported (1) (2). In addition, while we were carrying out our research and development, we discovered a lignan component, balanophonin (Figure 2), included in the polyphenols, which is an antioxidant(4) (6). In acute toxicity tests on rats, the limit test dose of 5,000 mg/kg was administered using feeding needles and no signs of acute toxicity effect were observed. There were no macroscopic lesions of organs observed nor any difference of body weight from the non-administration group (2). Repeated dose toxicity comprised 5% of the limit test dose with no observable adverse effects. In the mutagenicity tests, the outcome of the reverse mutation test employing bacteria and the chromosomal aberration test employing mammalian tissue culture cells were both negative (5). With these results, Moso bamboo extracts are very safe as an additive agent. Traditionally, it has been said that bamboo has antibacterial effects, and especially strong antibacterial activity was discovered in Moso bamboo extract. (Table 1) (1) (2) (3). 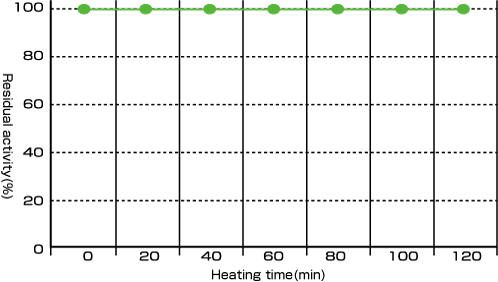 Furthermore, the antimicrobial effect of antibacterial ingredients is not reduced even after 2 hours of heating at 121°C (Figure 3). Moso bamboo extract is able to withstand heat sterilization and it can be effectively used (6).